There are four people in this picture. A woman is in the middle, and three children are on the left. One boy is wearing a cap, and the other boy is raising his hand. The girl is looking at animals. The woman is holding a flag. There are three sea lions in this picture. The sea lion on the left is standing on his hands. There is a watermelon on his head. 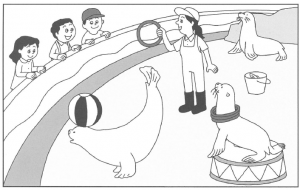 The sea lion on the small stage has three hoops on his neck. One is big and the others are small. The sea lion near the rock is looking up, and raising his one hand. There is a bucket in the picture, and in the bucket, there is a seashell.